It took a lot of time and failure to come up with a presumably straightforward game that could attract at least 200 dedicated players. Many of the earlier iterations really could have been developed into interesting party games for maybe 10+ people. However, the complexity of their systems could not be properly explained without at least 3 pages of rules -absolutely unacceptable to use for a game at PAX East, or any convention for that matter. Because these games couldn't be explained in less than 2 minutes and required a lot of materials or GM time, there was no feasible (or cheap) way to scale these for a large convention space without removing major components of the game. These conclusions drove us to focus on creating a game where simplicity would be absolutely required. From this and other critical ideas, PAX Pox was born! It has one core game mechanic. It can be explained easily without a pamphlet. Most importantly: it's simple! PAX Pox was quite possibly the most straightforward game I've ever helped to develop. We infected over 4000 people and attracted at least 500 infectors. It was beyond satisfying to walk around the expo hall and see badges covered with infection stickers. PAX Pox was a success! This is why I was so surprised to find out that even with all of our hard work developing a simple and interesting game for PAX convention goers there was an even easier alternative: Pipe cleaners. PAX East was made of lines - lines to get in the convention center, lines to go to concerts, and lines to get food. The higher ups at PAX East thankfully were aware of this and designed "line games" to keep the crowd entertained during a 2+ hour wait. One of their games turned out not to be a game at all and just involved giving a large group of adults tons of pipe cleaners. 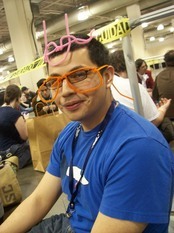 I can't express the sheer joy and excitement people showed when they got their hands on a pack of pipe cleaners. Of course, I shouted with glee like a 5 year old girl when I saw Enforcers tossing them into the crowd. People really took to the pipe cleaners and spent time meticulously weaving head gear, making Companion Cubes, or whatever their imagination called for. At one point, collaboration entered the mix and we started to trade for different colors. Though, the biggest collaborative event had to be joining together to make an extremely long pipe cleaner chain that stretched to the corners of the waiting room. These cheap artifacts from kindergarten were tapping into the creative conscious of a group of adults and giving them an outlet to interact cooperatively with one another. However, no matter how much fun it was at the time, the pipe cleaners didn't have staying power. Many people left behind their creations once it was time to leave or threw them out later. I packed mine away with the thought of playing with them later, but "later" still hasn't come. I'm bringing up the pipe cleaners because they present an interesting concept when thinking about designing convention games. Compared to PAX Pox, this was the simplest form of play: hand them out and let the players define their own rules or game. No need for GM-player interaction, score tracking, or even explanations. The problem is that a game which tries to follow this is only as fun as the player allows it. Without a clearly defined goal or structure, there is no incentive for the player to continue with the game or even retain interest. This is where PAX Pox succeeds because even though the awards were buttons and stickers, they still provided some kind of attainable goal for the players. The rules created a space for players to explore and test strategies, while the achievements gave them a way to track personal progress. PAX Pox may not have been as simple as a pack of pipe cleaners, but it was able to create dedicated players that were willing to play the game for all three days of PAX East. This is where PAX Pox succeeds as a convention game. This resilience among players, I have now learned, is something that should be considered as equally important as simplicity when designing convention games. We did get that one guy who used the pipe cleaners to make a model of MMORPGingivitis.